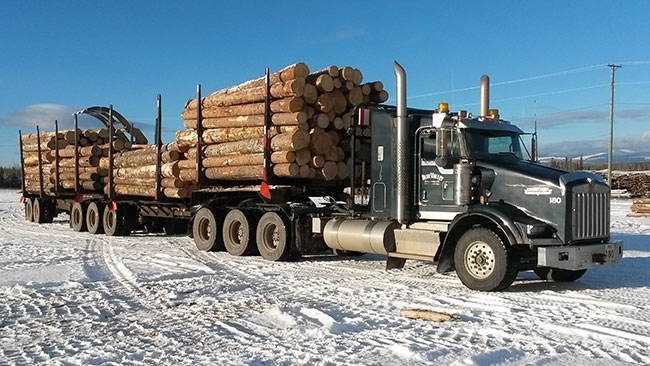 Feb. 10, 2017 - Nine-axle logging trucks, including tandem-drive and tridem-drive configurations, are now approved and in use on a key transportation route in the Vanderhoof area in north-central British Columbia. The approval was the culmination of a four-year collaborative effort between FPInnovations, the B.C. Ministry of Transportation and Infrastructure (MoTI), the B.C. Ministry of Forests, Lands, and Natural Resource Operations (FLNRO), and the forest industry. Transportation is a cornerstone of the B.C. forest sector and economy as a whole. Improving transportation efficiency improves the competitiveness of the B.C. industry. By adding an additional axle to the standard eight axles approved across Canada, these new configurations realize a payload increase of more than 15 per cent. This translates to a reduction in energy intensity (the amount of fuel consumed per unit of payload) of between five and 10 per cent, and leads to a similar reduction in greenhouse gas emissions. Since larger trucks mean fewer trucks on the road, overall safety for the travelling public is also improved – as long as the new configurations can be found to operate safely. Transportation ministries across Canada use stringent performance criteria to determine the safety and impact of these vehicles. In fact, Canada was the first to adopt performance-based standards to evaluate the dynamic performance of heavy vehicle configurations. FPInnovations, through many years of research and testing collaboration with various transportation ministries and industrial partners, has developed extensive expertise in evaluating vehicle configuration performance. This knowledge has led FPInnovations to be involved in a number of initiatives across Canada to develop and promote the adoption of safe, more efficient heavy vehicles; and was utilized to ensure the new nine-axle configurations met or exceeded the highest standards of safety. The evaluation process included analysis of the dynamic performance of the vehicles, their road space requirements, and the impact that they would have on existing roads and bridges. Those findings were then validated during road tests for both the tandem- and tridem-drive configurations. This involved close observation of factors such as how well the vehicle stayed within lanes on curves and maintained its speed while climbing hills. For both configurations, the prototype trailers used for the tests performed as expected and, most crucially, within all safety parameters. Following these trials, another key hurdle was cleared when further engineering assessments determined that all the bridges on the proposed route were able to safely carry the new configurations. With these evaluations successfully completed, MoTI was able to begin the process of authorizing trucks on this first route. The approval of this first route benefits multiple forest companies in the region. The knowledge gained from this process will also have broader benefits – the first steps towards approval of additional routes for these nine-axle trucks are already underway. FPInnovations, in cooperation with MoTI and FLNRO, is currently developing two documents to help the industry adopt these new configurations. The first is a “road map” document to ease the process of securing future route-specific approvals. This document will also provide guidance to manufacturers on the specific range of vehicle dimensions that have now been approved. The second document is a technical guide, which the industry will be able to use to evaluate if its resource-road network is capable of operating these nine-axle trucks, on a route-by-route basis. Broader use of nine-axle logging trucks in the B.C. forest industry is estimated to have the potential to create $36 million in savings, to reduce fuel consumption by at least eight million litres, and to decrease greenhouse gas emissions by over 21,000 tonnes of CO2 annually. In addition, work is continuing on obtaining regulatory approval for other more productive truck configurations in the province, including a new chip hauler concept, more productive flat deck trailers, and other vehicles vital to other B.C. sectors – all of which must meet the rigorous standards for safety and benefits to the public met by these nine-axle logging trucks. It is also hoped that operational experience with these vehicles in B.C. may help pave the way for their approval in other jurisdictions in Canada and elsewhere. The industry recently gained important additional transportation flexibility in New Brunswick. In this case, it took the form of approval of specific heavy haul corridors around the province – aligning with key wood flows – on which forest companies can apply to operate a variety of larger truck configurations. This regulatory change followed assessments conducted by FPInnovations of several of the specific truck configurations now permitted on the corridors to confirm that they could be used safely. The provincial government also assessed potential impacts on road infrastructure. The capacity increases vary from two to seven additional tonnes of payload, depending on the specific route and configuration. As in the case of approval of larger logging trucks in B.C., greater capacity per vehicle improves the efficiency of fuel use, and reduces both costs and environmental impacts. The impact may be particularly significant in the southern part of the province, where regular weight restrictions are more stringent. In Nova Scotia, FPInnovations recently began an assessment of alternative truck configurations, which currently involves cataloguing various options. It remains to be determined if and in what form allowance for heavier payloads will be made in that province. For more information, contact James Sinnett at james.sinnett@fpinnovations.ca or Jan Michaelsen at jan.michaelsen@fpinnovations.ca from FPInnovations’ Transport & Energy research group, or visit www.fpinnovations.ca.